Construction of timber formwork for the new east retaining wall. The concrete structure shown in the right side of the photo is a stay-in-place shoring system so crews can safely work on construction of the new wall. The majority of recent work activities revolves around preparations for a retaining wall on the east end of the project - a wall composed of more than 400 cubic yards of concrete. A procedure using special liners within the formwork and staining of the concrete will allow the new retaining wall to mimic existing structures within the area. Construction has also progressed at the ramp to Porter Street. New sidewalk, curb and gutter, as well as a new curb ramp meeting ADA requirements have been placed along the south side of the ramp. Stormwater structures, utilities, and walls - lots of walls - comprised the bulk of the KVT project work over the past few weeks. In its heyday, Klingle Road had hundreds and hundreds of linear feet of walls supporting the roadway, the stream channel, and the surrounding drainage structures. Some of these walls are still in great shape and will last for many years to come; others not so much. And a restored stream channel means new pipe culverts and headwalls. The latest stormwater structure to be built on the KVT project will act as a "relief valve" Klingle Creek at its flattest point along the trail. During heavy storm and flood events, the stream will overflow the bank and collect in a flood control structure. The overflow will travel through two elliptical pipes to a smaller stormwater channel that rejoins Klingle Creek approximately 200 feet downstream. Construction of the structure, as shown in the next two slideshows, was performed in an upstream direction, a standard industry practice. The crew started from the outfall headwall and installed pipe north towards the stream. 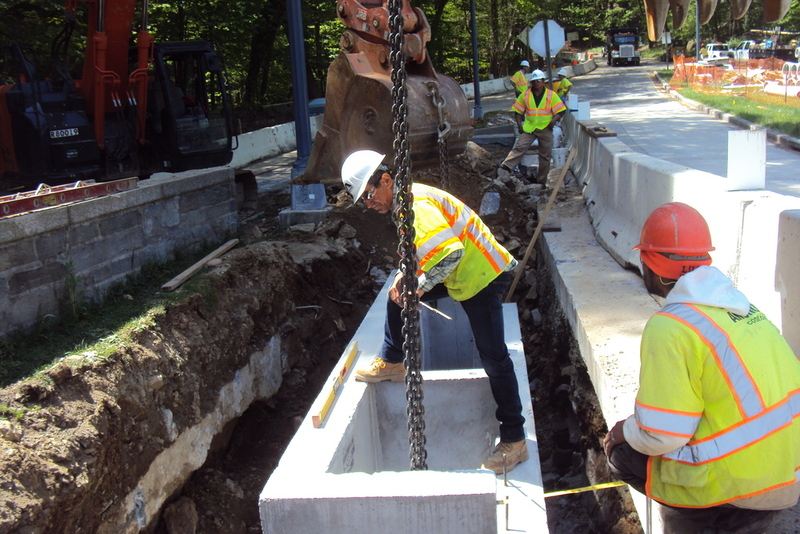 Once the pipe and the outfall headwall were in place, the crew installed the flood control structure. Note that all headwall stone was salvaged from original collapsed walls along Klingle Road. 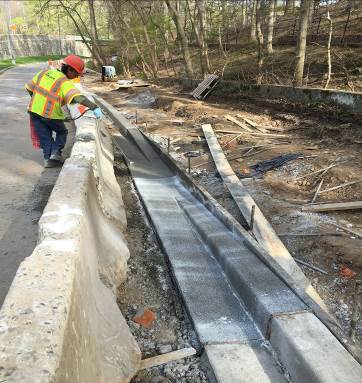 The contractor also started work on a 210-foot long retaining wall on the eastern end of the trail. The new wall replaces an existing stone wall that collapsed into the creek long ago. Construction on this wall will continue for the next several weeks. Utility work continues throughout the project. 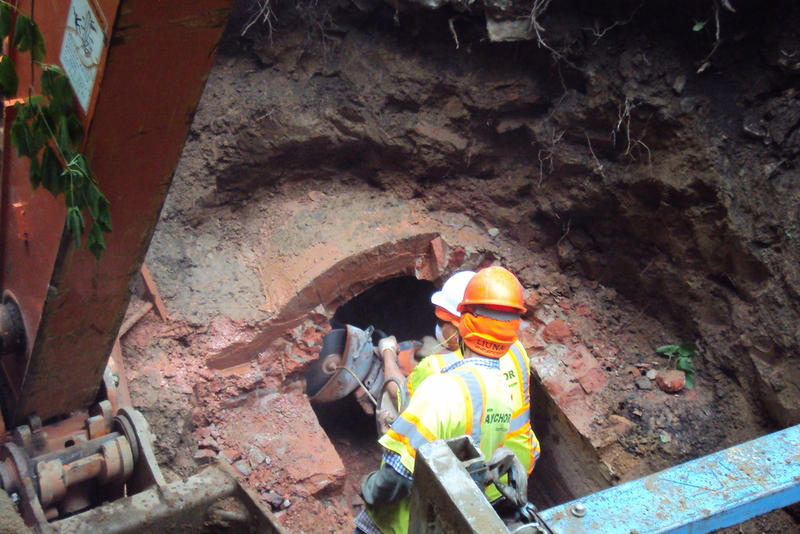 The KVT contractor recently replaced a 100+ year old segment of sanitary sewer pipe along the future trail on behalf of DC Water. Washington Gas also continued gas main replacement along the project footprint, most recently working on the final replacement segment from Klingle Road to Porter Street. Click through the slideshow below for the photos. The Klingle Watershed Green Streets project is hosting its second design phase public meeting on Monday, June 13th from 5:30-8:30 PM. The meeting will be a walking tour of candidate sites, starting at the intersection of 36th Street and Lowell Street NW. Click here or on the images below for the full meeting flyer. The Klingle Green Streets project team gave a initial project presentation at the KVT public meeting last November - click here for a link to the presentation. Today's rain storm/snow melt provided the second test in three weeks of the restored segments of Klingle Creek. Even in their unfinished and un-vegetated states, the step pools, bank armoring, and flow controls are working well. Here are a few videos of the creek in action! Also within Segment 4, you can see the Riffle Grade Control and Log Structures described in previous construction updates functioning as designed to reduce flow velocity in the channel. We've had a busy few weeks at the KVT project. 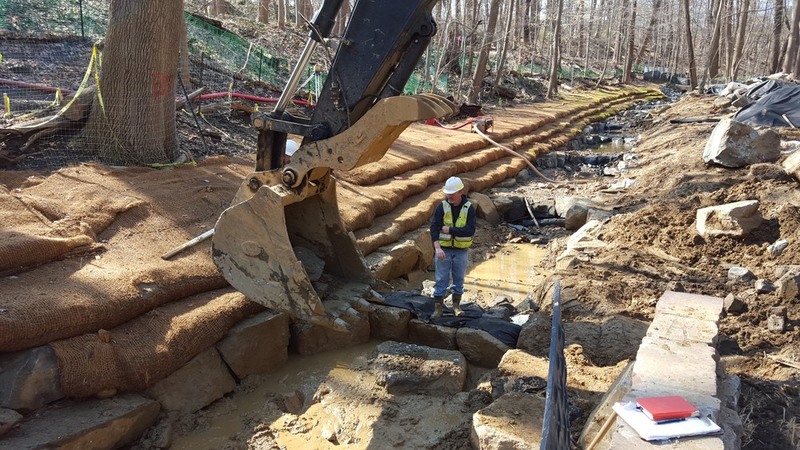 Stream restoration work is nearing completion, and we are starting to prepare for the next phases of the project, to include roadway demolition, storm water and drainage construction, and trail construction. It should come as no surprise to those in the DC area that the ever-changing weather has had a major impact on the project over the past three weeks. ...which melted and was quickly washed away by the rain. That said, the new stream features in Klingle Creek held up very well considering they are unfinished and not yet vegetated. The step pools and tailout areas easily handled heavy flow from both snow melt and rain, demonstrating both the added capacity and erosion protection that the stream restoration features provide. 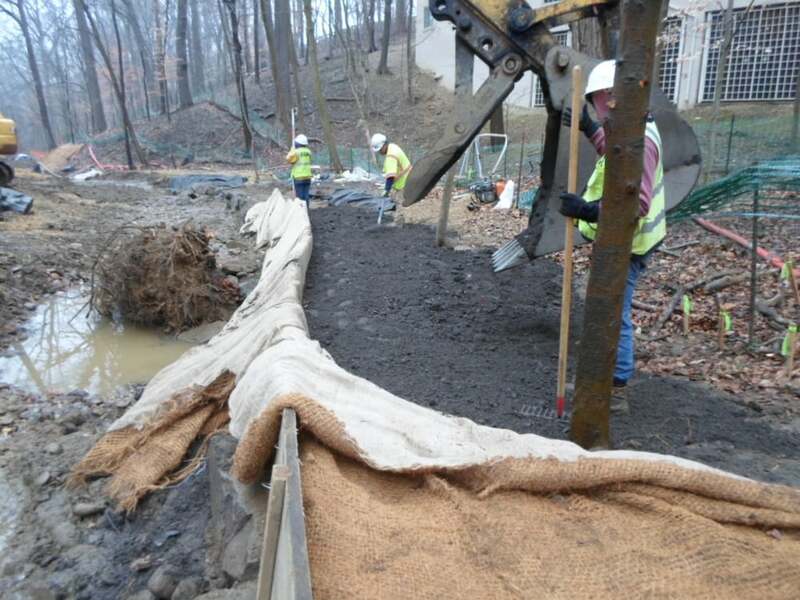 With the remnants of the historic snow storm downstream, the restoration contractor was able to return to work in Klingle Creek. Recent work includes step pool, stone toe (stream bank armoring), and fabric encapsulated soil lift construction. Completed fabric encapsulated soil lift. Step pool wall construction. A crew member sets the top of the stone to the correct elevation with survey equipment. Stone toe (i.e. stream bank armoring) in progress on the upper reach. 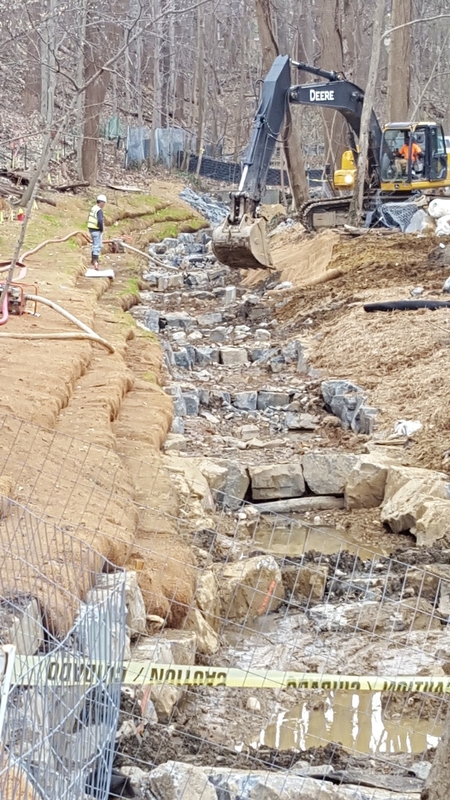 The contractor also completed a riffle grade control feature, which mimics the naturally-occurring flat areas in streams where the water flows over a mix of river rock and small boulders. 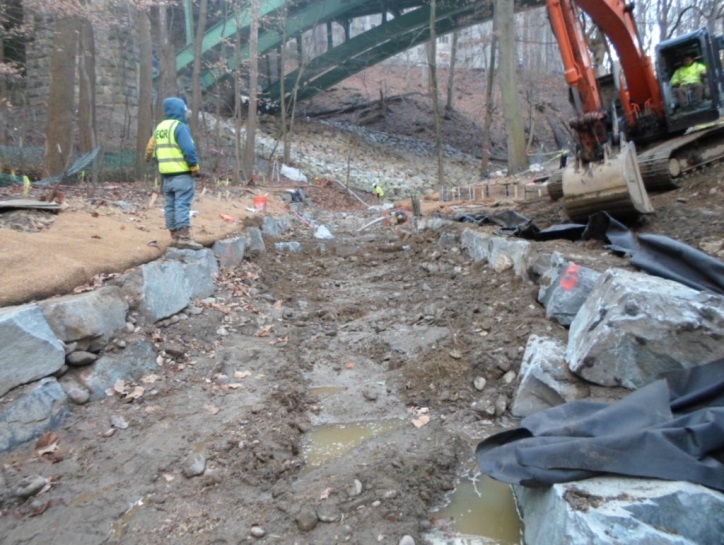 The contractor sets a specified mix of stones and river rocks in the riffle grade control. Smaller rocks and pebbles are washed into the gaps in the large stones to finish the riffle grade control. The contractor also started work on clay channel blocks, which span the width of the stream channel and extend 4-5 feet into the earth. Clay is the most dense of all naturally-occurring soil materials, and when well compacted it forms a water tight barrier. The groundwater level in the upper reach of Klingle Creek is high, and these clay blocks will reduce the amount of groundwater that bypasses the stream channel. 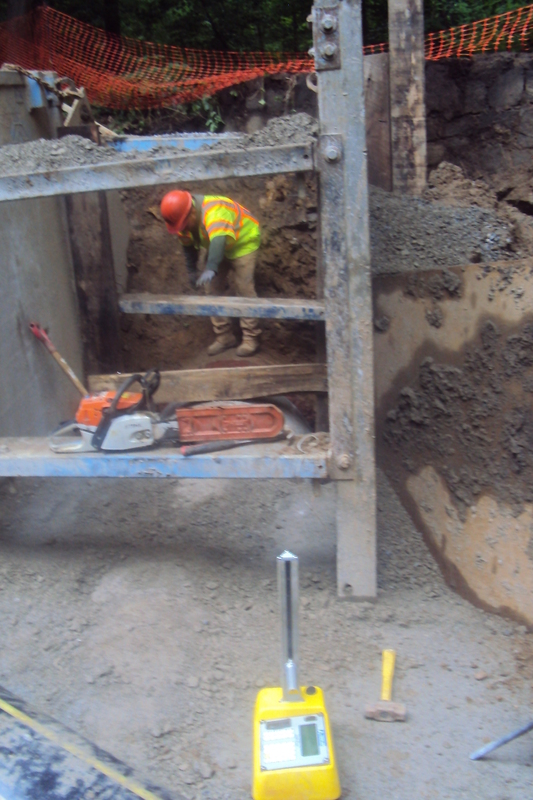 A DDOT inspector tests the density of the compacted clay in the channel block. 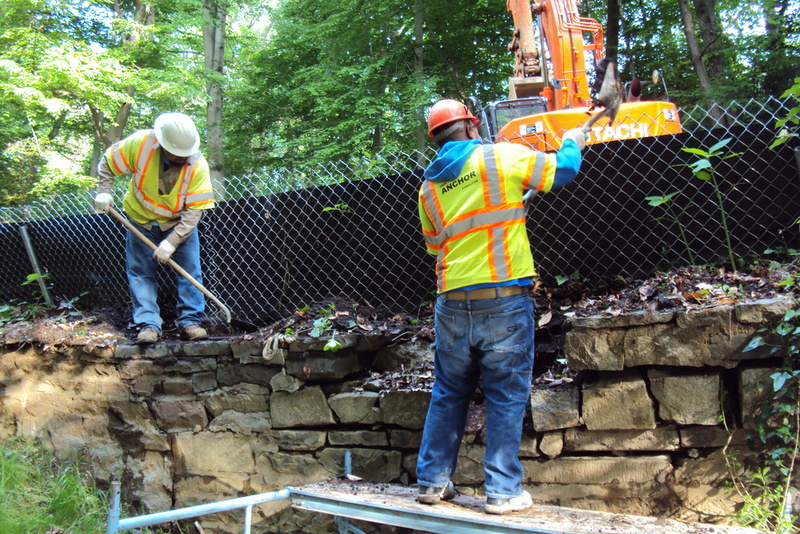 Meanwhile, the new retaining wall across from the Woodley Park Towers is nearing completion. The salvaged stone finish is taking shape! A mason applies mortar between salvaged stones. Happy Holidays and (almost) Happy New Year from the Klingle Valley Trail team! We wish everyone a safe, healthy and productive 2016. The new year will bring great transformation to the Klingle Valley, and we aim to have the new trail ready for opening around this time in 2016. 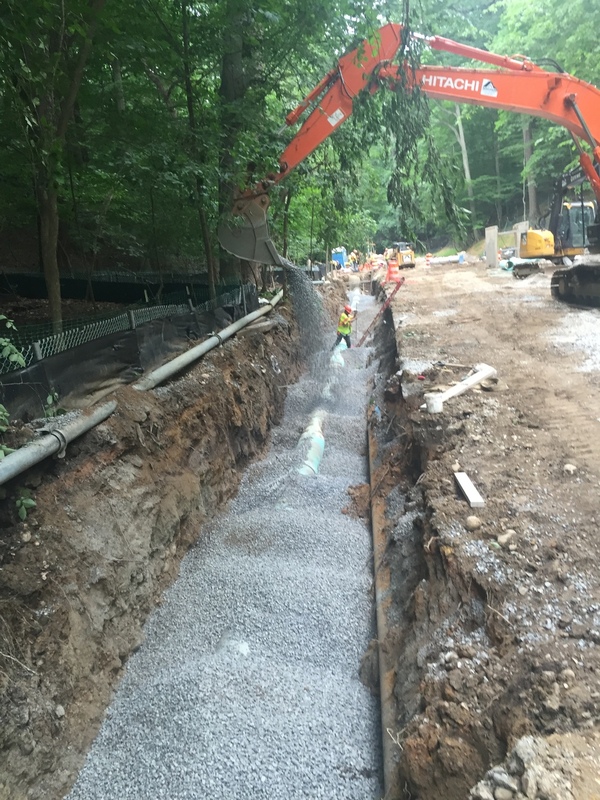 Despite the holiday and rain-shortened production weeks, the KVT contractors have been hard at work along Klingle Creek. 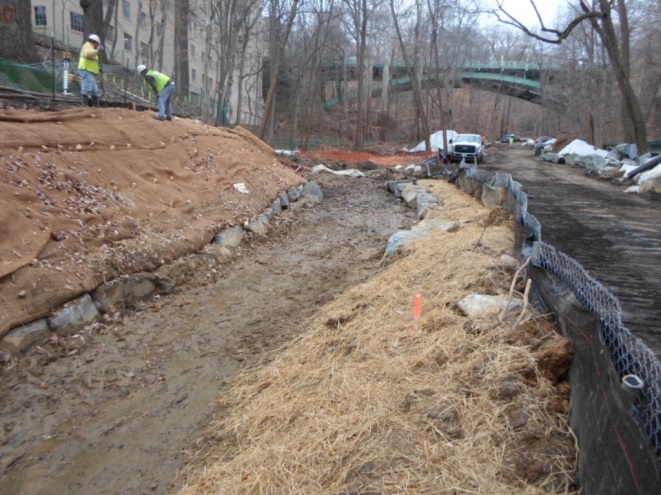 Stream restoration east of Connecticut Avenue is moving at full steam, with two crews now at work.Both crews have been excavating the new stream channel, adding stone stream bank reinforcement, and constructing step pools. We even installed our first log placement to create new aquatic wildlife habitat and reduce stream velocity. The logs come from trees that were removed to accommodate the new channel and are embedded in the stream bank with the root wad submerged in the creek. Log placement embedded in stream bank with root wad submerged in creek. 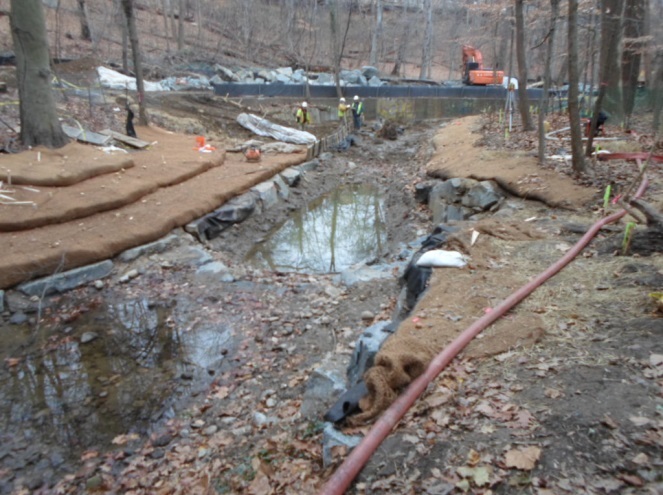 The contractor is also carefully incorporating existing drainage facilities into the stream restoration features. A good example is a 80+ year old terracotta drain pipe that was trimmed and tied into the stone wall and step pool. 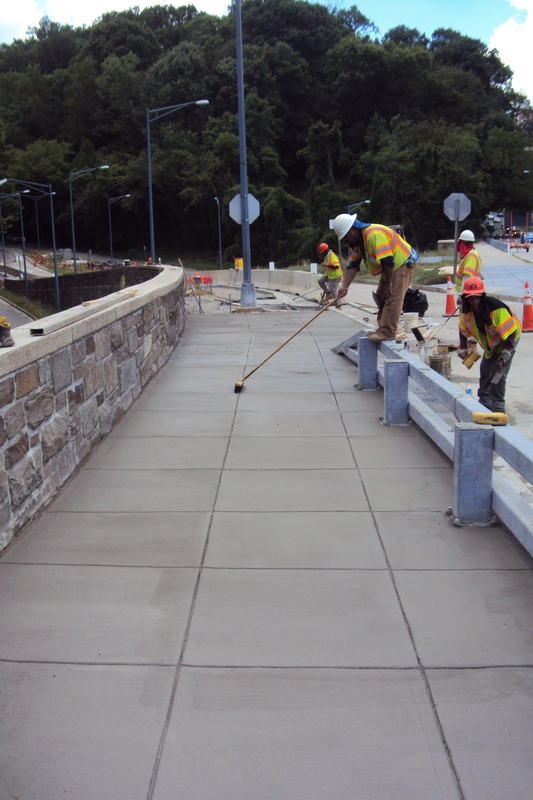 Further upstream, the prime contractor installed the concrete stem for the new retaining wall to be installed opposite the Woodley Park Towers building. Following concrete placement, the wall was backfilled with soil and porous stone. A perforated drain pipe runs along the back of the wall to allow the fill area to drain. The exposed face of the wall will be built with salvaged stone from collapsed retaining walls along Klingle Creek. Porous stone backfill placed for the remaining height of the wall, encompassing the drain pipe. The masonry wall facade will be constructed with stone salvaged from historic retaining walls along Klingle Creek that collapsed. 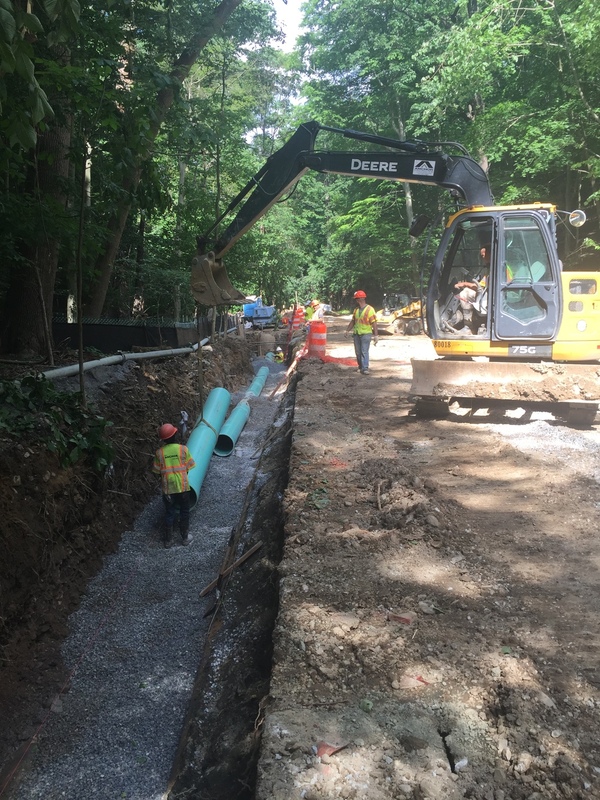 Washington Gas is nearly done with Phase 1 replacement (Klingle Road between Cortland Place and Connecticut Avenue). The line is now tied into the existing gas line and will be activated in the next few weeks once Phase 4 is complete (Cortland Place and Devonshire Place). 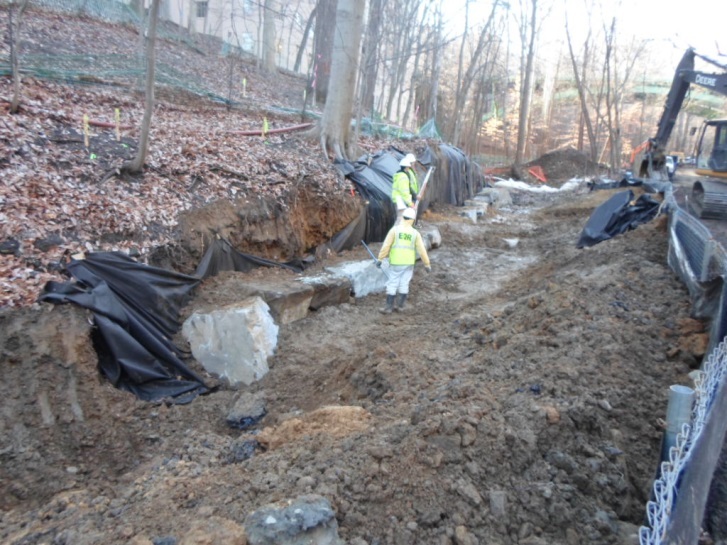 Stream restoration work has been the priority activity on the project for the past two weeks, with the stream restoration contractor, Environmental Quality Resources, focusing on Segment 4 east of Connecticut Avenue. 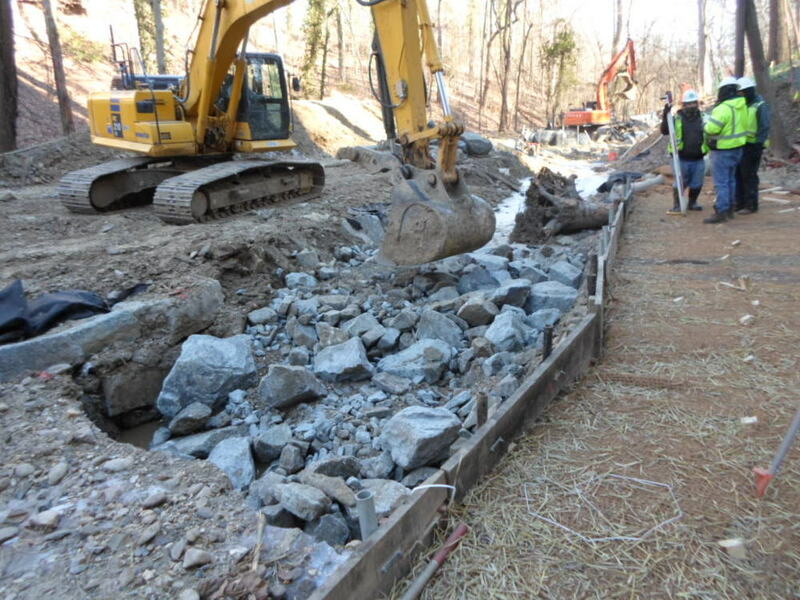 Stream restoration work for the past two weeks focused on Segment 4, east of Connecticut Ave. The contractor started Segment 4 work by establishing the new stream banks. This was achieved by excavating the existing banks and installing large stones cut roughly into blocks. The blocks (called "imbricated riprap") are stacked in such a way to armor the stream bank and greatly reduce erosion. On the opposite bank, EQR started installation of fabric encapsulated soil lifts. These soil lifts will be vegetated and will absorb overflow during flood events when complete. Once the stream banks are built up, the contractor will then install step pools within the stream. Step pools greatly reduce stream flow and erosion by temporarily pooling water before it cascades to the next lower pool. Segment 4 will have 15 step pools when complete. EQR installed the first step pool boulder cluster last week. Boulders for step pool clusters are carefully selected to ensure a watertight fit. The westernmost step pool boulder cluster in Segment 4 was set last week. Overhead schematic of a step pool. Finally, the contractor removed two Ash trees along Klingle Road that will soon succumb to the Emerald Ash Borer (EAB) epidemic. Given the trees' size and position hanging over Klingle Road, the trees had to be removed for safety purposes. Click here for more information from DDOT regarding Ash trees and the EAB. Crews remove an Ash tree along Klingle Road. If you follow us on Twitter or were listening to your radio the weekend of November 14th, you'll know that the project was the subject of a story on WTOP radio and wtop.com. Click here for the story. Thank you to all who attended construction public meeting #2 last night. Click the image below to view the presentation (pdf format). Please send us your questions and comments via our public outreach page. The last few weeks have been a reminder of the beauty of the Klingle Valley and what a great public space the KVT will be. There wasn't much time to look around, though, because utility work on Klingle Road continued apace. The Phase 1 finish line is in sight for Washington Gas, with about 300 feet of trench to dig and pipe to set. The last segment of Phase 1 is a tough one, though, with multiple existing sanitary sewer and storm drain pipes to navigate. 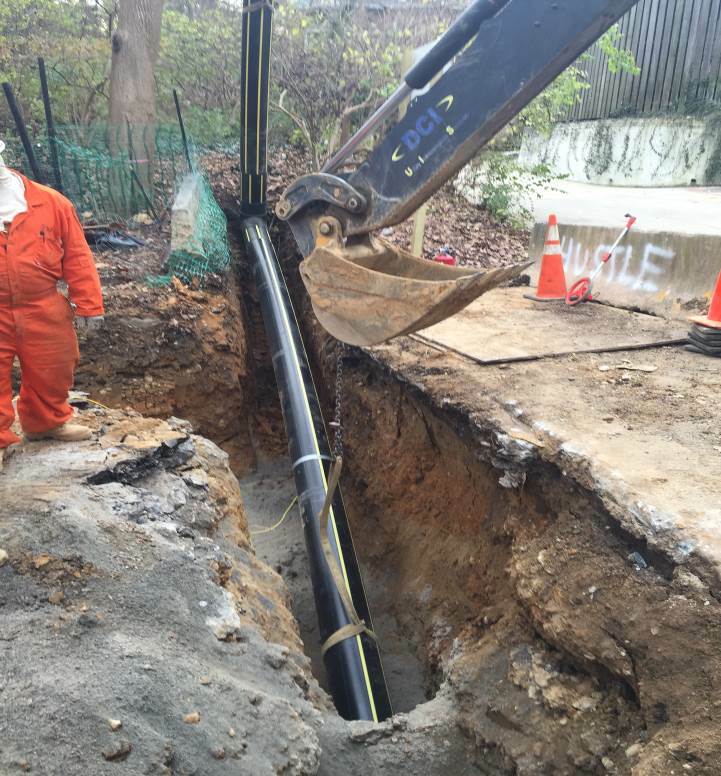 Washington Gas also continued replacement of the gas line along Cortland Place this week. They've completed the tie-in to the existing line at Klingle Road and will continue working towards Devonshire Place. Here's the current status of gas line replacement. 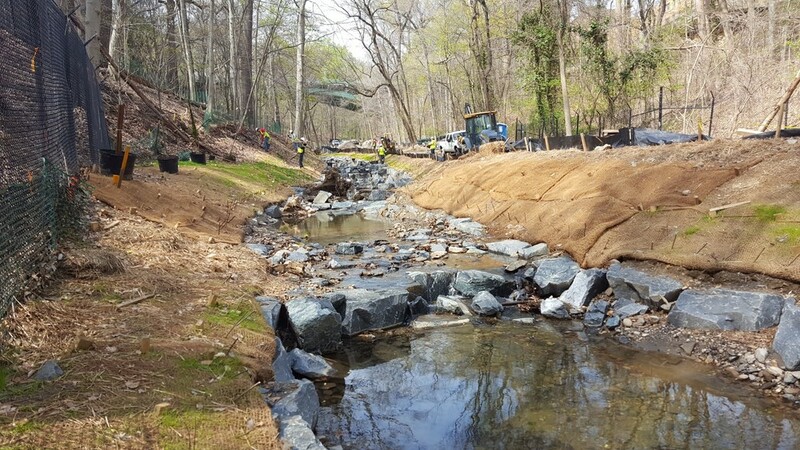 Final preparations were put in place this week for Klingle Creek stream restoration work, which starts next week. Surveyors marked out the stream channel and a tree service was on site removing trees whose roots are either underminted or blocking planned stream features. The DDOT construction team is coordinating all tree removals with the National Park Service, the Tregaron Conservancy, and the DDOT Urban Forestry Administration. Our second public meeting for construction is scheduled for Thursday, November 12th from 6:30-8:00 pm and the Cleveland Park Library, 3310 Connecticut Avenue NW. 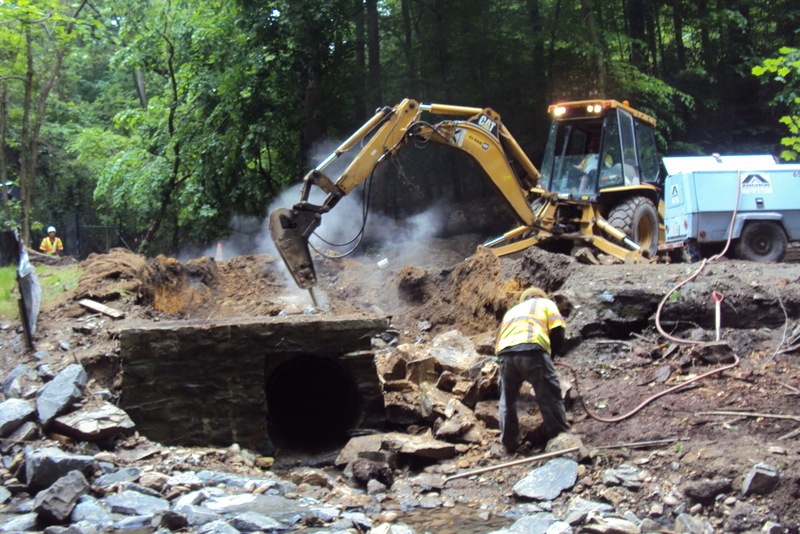 The team will provide construction schedule updates and will preview the upcoming stream restoration work. We will also have a Q&A session to address any questions or concerns about the project or the gas line replacement work. We hope to see you there! Until then, here are a few more fall foliage photos along the future trail.